Time to start a new thread for TCB rather than leave it in the "Unknown Japanese Brands" one as it's very well known now. Post all your TCB non-competition stuff here. Very good idea! TCB is known enough around these parts and we have several members who can boost this thread! I agree tcb deserves a thread! 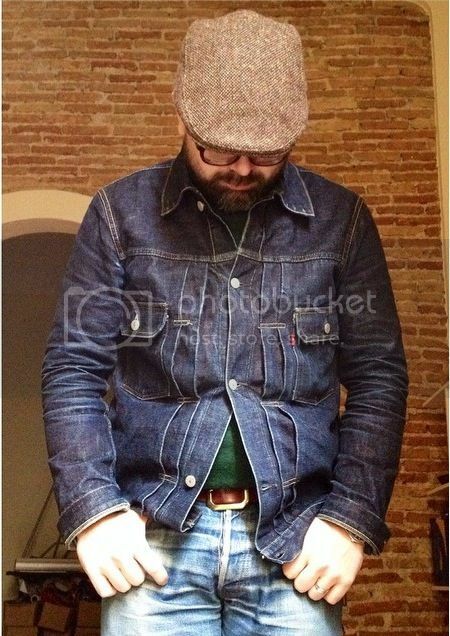 I repost my tcb trucker jacket. Fantastic! I'll gather some info soon! Maynard, about time for a review of your Seamen jumper! And while you're at it throw in a few fit pics ahah! There is so much puckering and roping in that photo I'm afraid I might have a seizure. 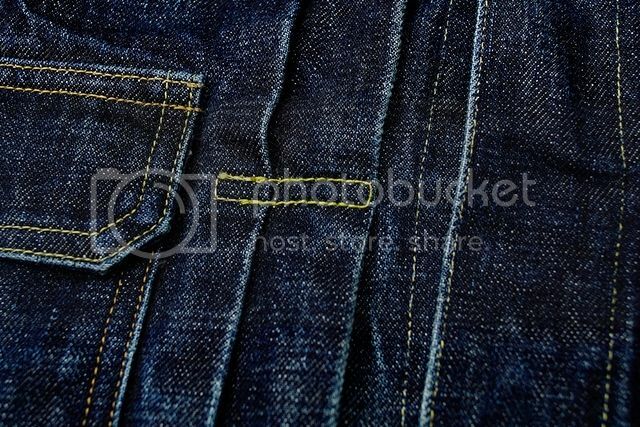 for posterity's sake, here's some infos on TCB 60's that were already posted on the Unknown Japanese Brands thread. 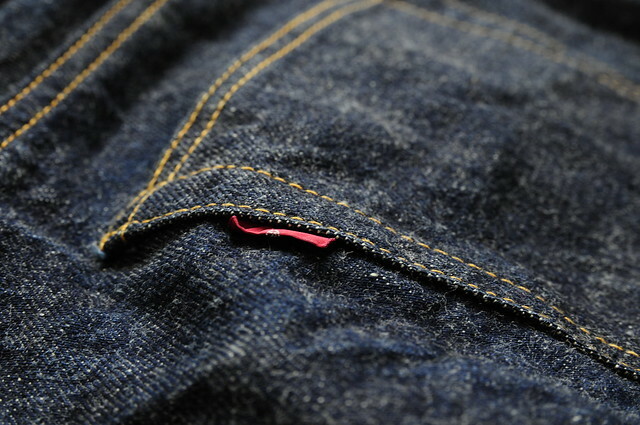 TCB 60's are Inoue's san's repro 66 cut, they're made out of a beautiful unsanforized 13.5 OZ denim. 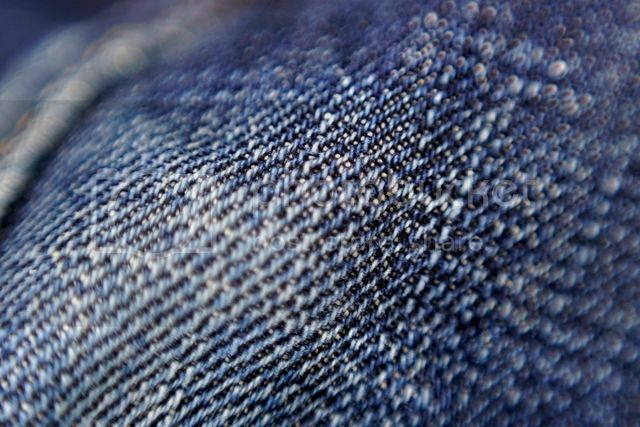 The cotton used for the fabric comes from San Joaquin Valley, California. The silhouette is clean, however this is a true 66 repro cut, so it's not tapered as much as other Japanese brands take on the '66 cut. 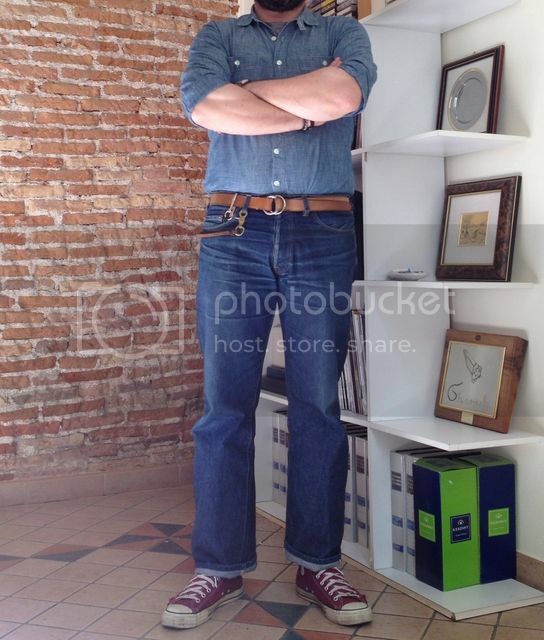 TCB garments run always very true to size. 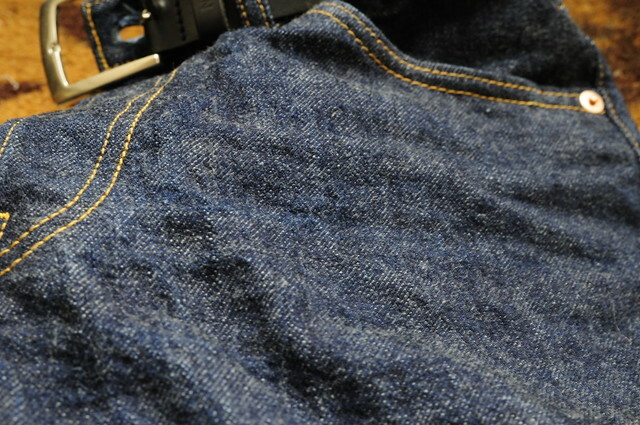 TCB 60's can be either bought raw or one wash. 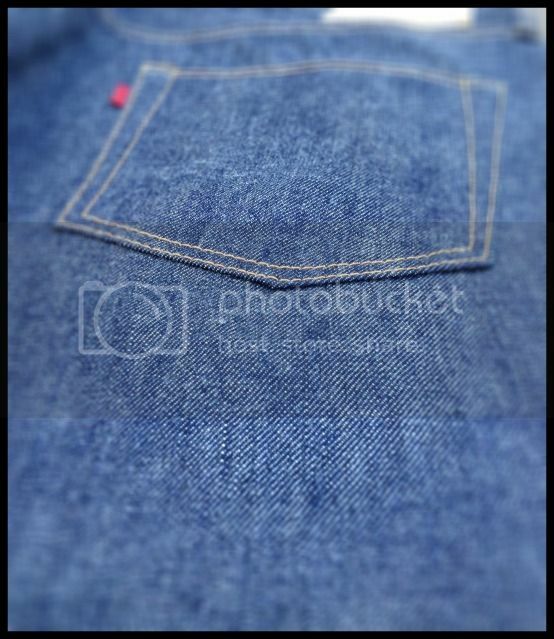 I won't repeat my posts from the unknow japanese brands thread, but I just wanted to post some pics of the texture of the 60s denim. I concentrated on texture rather than colour in these pictures (hence the weird lighting), but they are utterly unmanipulated and the colour is pretty true. 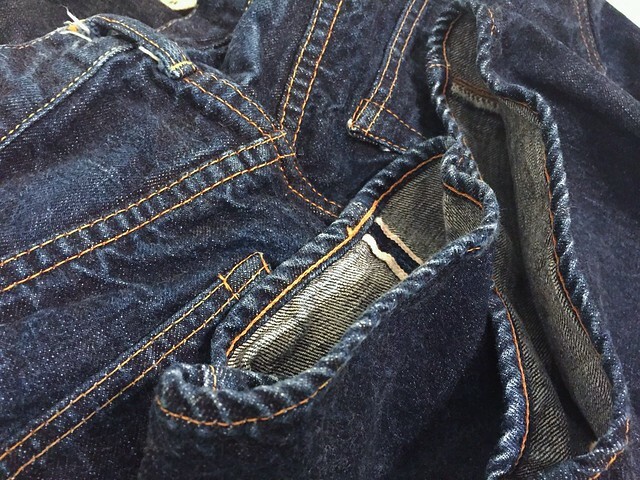 the denim is unworn, once soaked from TCB 60s. @st199ml what a jolly shoreman! 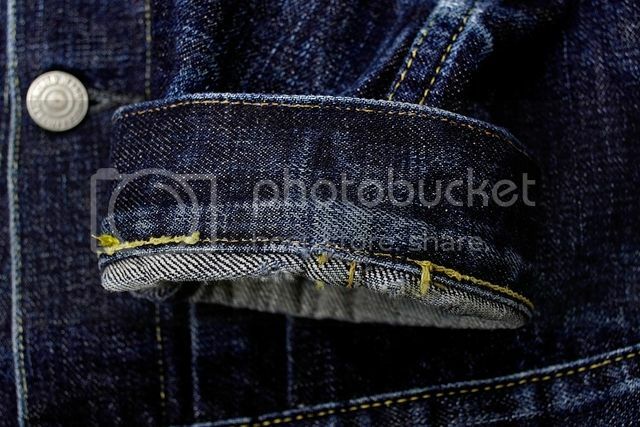 @holio well done you're unworn texture pics are way better than mine, back at that time i didn't have a camera! P.S - I am now drinking the Passalacqua Mekiko blend, which I think I prefer to the Harem. The roast is a little lighter so it's a little less 'ashy' to my taste. The tin is not so pretty though :-) Maybe there should be an espresso thread here too? Naples roasting tradition has always been towards the darker side of things (eg coffee beans are roasted slighty more than what's the average taste of people nowadays in most parts of the world). I like it, though I know many don't. you probably wouldn't like another great Naples brand, Kenon, whose beans are almost black, I totally love it! coffee is 100% arabica beans but it's quite roasted ending up with a more robust, stronger taste than your average 100% arabica. Mekiko is an excellent blend for everydays use, it's even fairly reasonable in price if you have the chance of avoiding shipping expenses. though I think that Harem is more special. 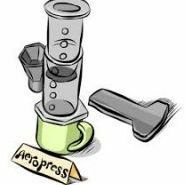 I'm up for the coffee thread, although if you really want to dig deep in these matters you should head over at thehomebarista forum! Does TCB use cotton threads, sure I know the answer but want to be 100% sure. Also, since TSS site doesn't seem to be up, and having a hard time with tcb online, does anyone have measurements for a 60's in a 33 or 34? I'd say so, cotton threads, though I am not entirely sure. 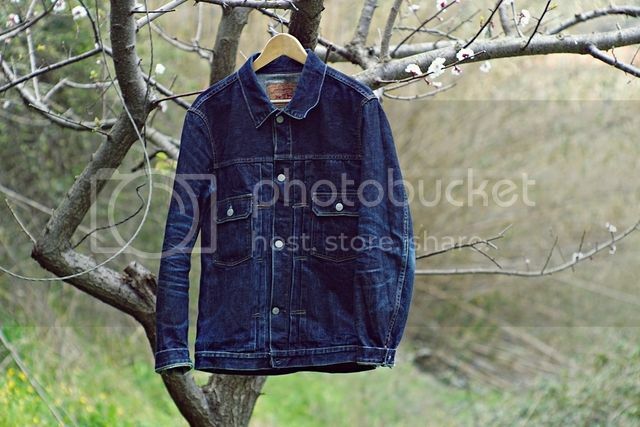 I'm sure for the 50s garments, the threads wears and also breaks quite easily in the stress points. Must be cotton. 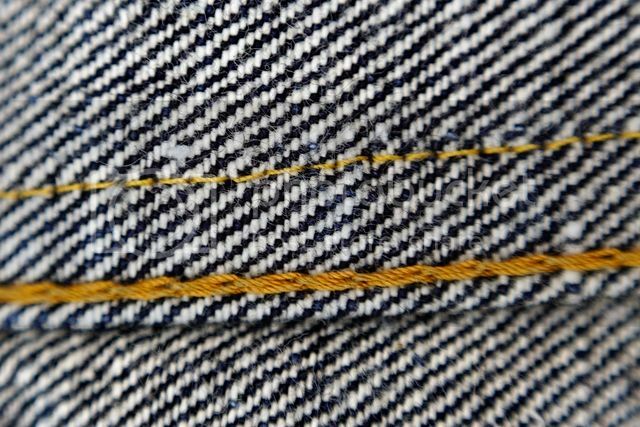 for the 60's it looks like cotton but I have almost no broken threads on my 14months pair above. Can't find anymore the detailed brochure that was on TCB website awhile ago. all nicely written in japanese for your fine understanding! 33 size measurements are not mentioned anywhere but I am sure Inoue makes it. Shoot him an email or a facebook msg. his email is on the contacts page of his blog. yeah that's why I ffigured they were cotton, just by browsing the contest thread. 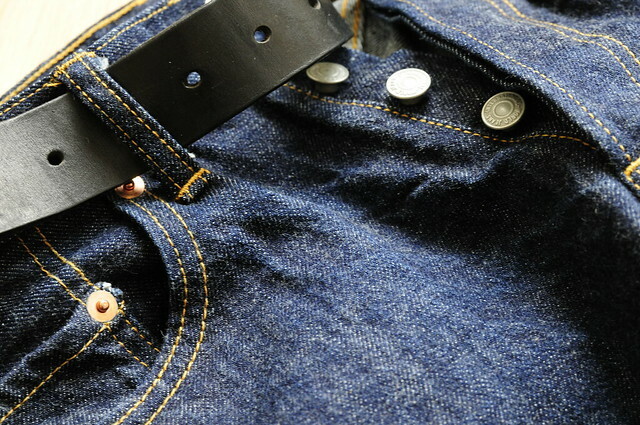 But I am quite surprised the 34 is barely a 32" waist, might need a 36 which feels weird to say. No way! Measure your waist with a tape and size accordingly. If in doubt ask Inoue he'll sort you out! I think you could do either the 33 or 34. Inoue will most likely suggest you 34 though. My size 32 was a shade over 82cm pre soak if that helps? It's about 79cm post soak, but I guess will stretch back. 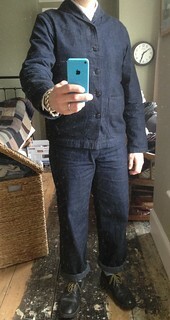 St199ml, Seaman's fit looks great on you. 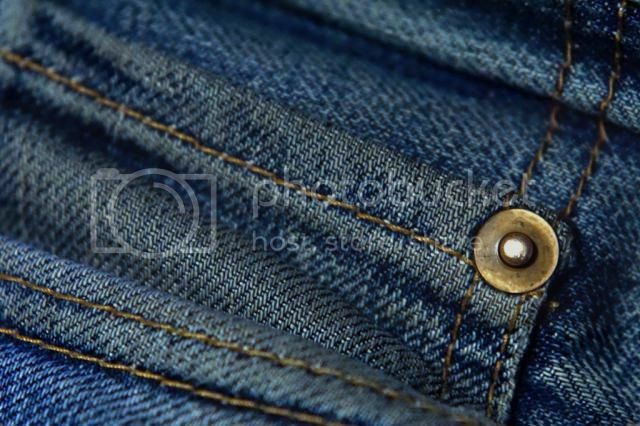 I had it in my head that the jeans were much wider than in your pictures and that I wouldn't be able to pull them off - seeing those pictures is probably the last thing my wallet needs! I gave it a wash yesterday, and it's still hanging dry now. Over the weekend i'll try to post more pictures. 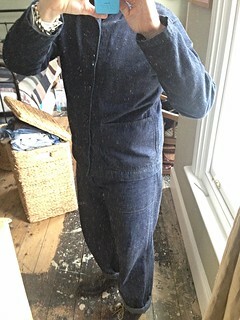 Next week I'll have to bring it over to the tailor for some repairs. Some of the stitching is unravelling and I need bits and pieces to be re stitched before the jacket falls apart! I gave it an hard time with all the wear and tear so It's not a workmanship fault of course! Jeans peeking under are TCB too, how predictable of me! looks so awesome! well done! Love how that jacket has worn Volvo. What's the washes been like on it? 4 washes, 13 to 14 months of wear. 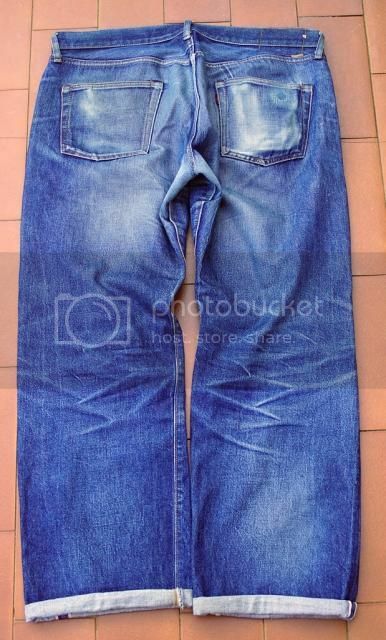 I gave it a 5th wash yesterday, it should be dry now..I look forward to go back home and see if there's anymore significant evo..
Should you ever pick a pair of 60's jeans I'd be most curious to see your evo on them! 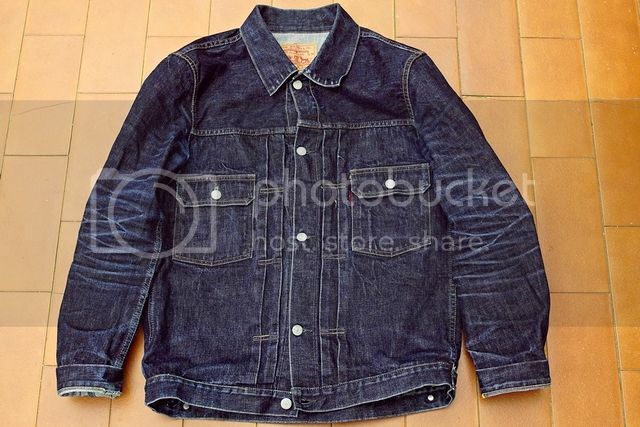 and here's a little update on the jacket, after the 5th wash and some repairs by my pretty Chinese seamstress! after the wash I see a more prominent marbling, especially on the lower front part. the stitching it's a just a tad more vibrant than the thread used by TCB, no big deal though. 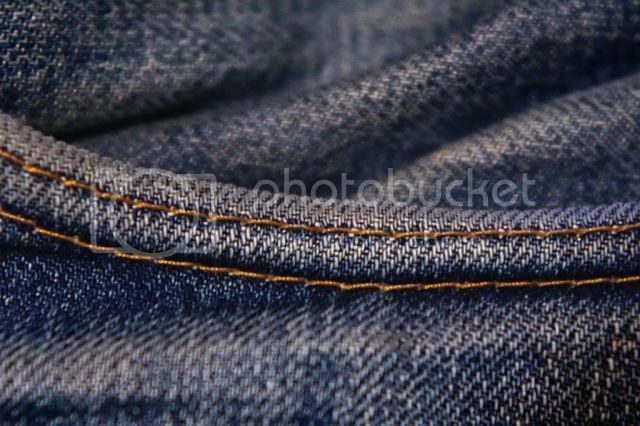 close up of the elbow fade, perhaps my favourite part of the jacket. with wear and tear that area had developed an incredible colour variation. 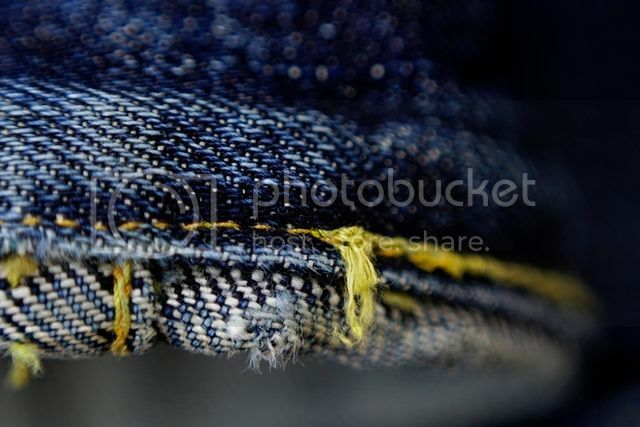 close up of some further lockstich repairs, not as pretty as the chainstitch but now the thread won't unravel! Bingo! Super pics volvo, loving these. Great repairs as well, I like that they aren't the original stitch type as it adds more variation and character in a way! I received a pair of Oranges yesterday that I ordered a while back, pulled the plug after seeing pictures of a girl wearing them on the TCB instagram. Had to pay almost Â£45 in customs and fees, always a game of chance - some stuff goes straight through and some doesn't, but I can live with that since the jeans are so nice. 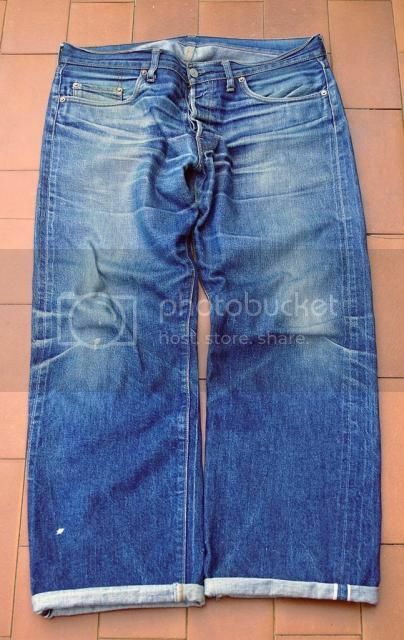 They look one-washed; no tags, crinkly texture, a bit of roping on the hem, plus the measurements are smaller than on the website, but it doesn't say anywhere that they are. I really, really hope so though, because they are quite tight as they are and I can't handle a lot of shrinkage. Oh well, either way a good excuse to hit the threadmill.